Paradoxically, the raw industrial concrete of Frith Street’s spaces suits the delicate work of Anna Barriball perfectly. The uncompromising toughness of the gallery, punctuated by its stolid columns, serves to train the eye all the more acutely to the artist’s fugitive colours and quietist subjects. Barriballs first solo exhibition on Golden Square was a decade ago, when she showed an untitled installation of leaves, cut from vintage fabrics, scattered across the floor. The deftness of the gesture, the lightness of touch and simplicity of the proposition made it all the more captivating that it effortlessly held this muscular space. The work sign-posted nature and culture simultaneously, evoking an autumnal garden as well as old summer dresses. If there was melancholy there, it is welcomed. Installation, film and drawing are the core of Barriball’s practice. Her subject is the everyday, the little-noticed, the almost imperceptible. The passage of time is a constant theme, as is a penetrating focus on minute detail. Slow right down. Breathe. Look. People familiar with Barriball’s work will know her drawings well, the graphite on paper works that render the texture of windows, floors and walls through rubbing. 1:1 scale, indexical records of found objects, the graphite produces a shimmery, silver grey surface that spoke of intimate domestic spaces, of architectures soon to be renovated away. 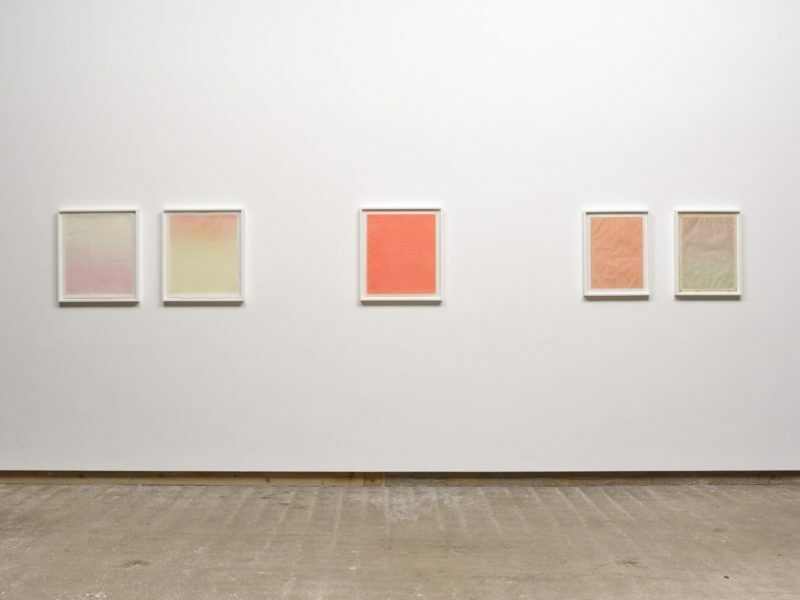 In the current exhibition the works on paper began life being tinted and then dipped into molten wax. 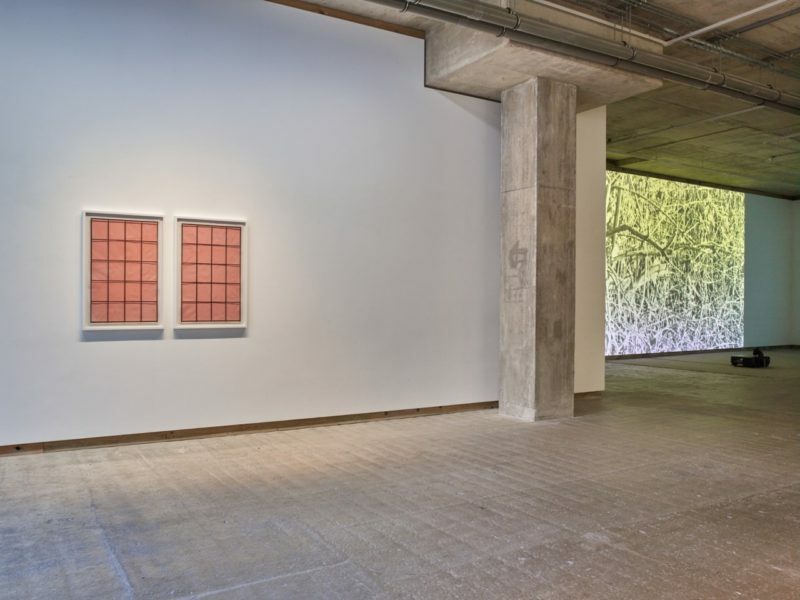 This new medium is then worked into the texture of found window glass to produce a series of works that radiate different shades of rosy blush through a translucent surface that leans towards the fleshy. Dense patterns of shells, or abstract geometric shapes dimple the surfaces. The work allows space for the viewer to bring their own associations and narratives to hover around each piece. 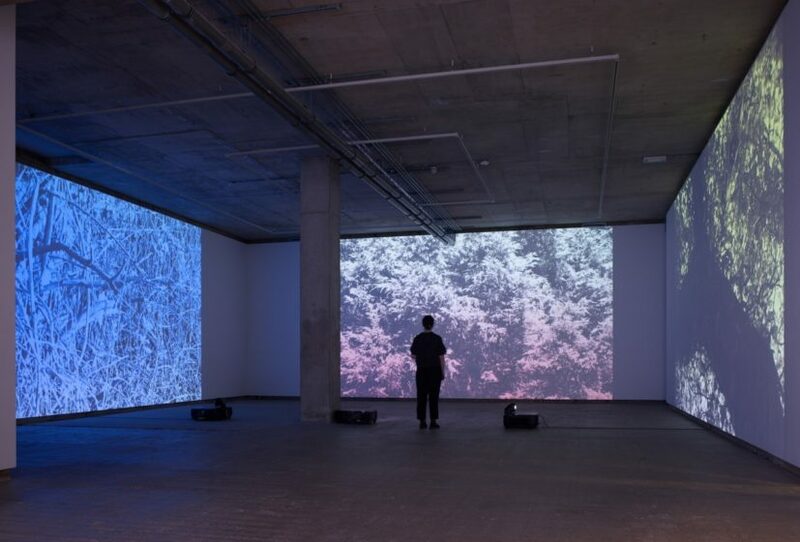 The large-scale film installation here obliquely recalls a much earlier work. Draw (fireplace), 2005, is a video showing the draft in a chimney alternately sucking and blowing a piece of paper placed over the fireplace. The rhythmic rise and fall of the billowing paper again works in a terrain between the body and the built environment. 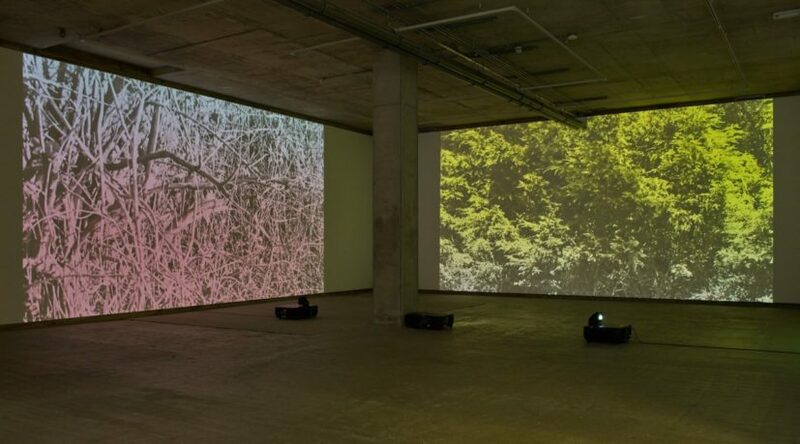 In Fade, 2017, three large, abutting projections feature close ups of the vegetation in the immediate vicinity of a wind turbine. The turbine’s rotation is described by the swift passage of down draught in the leaves, and by the shadow of the blades that unhurriedly travels across each screen like the sweeping hand of a clock. The film is tinted with colours that subtly change with each passage of the turbine’s blades. The colouring techniques of early cinema are a reference point here, and as with her drawing practice the techniques themselves are laboriously and not quickly achieved. The idea of duration is embedded in the work on multiple levels. Meditation and endurance are words that Barriball uses in relation to her work. There is also a powerful sense of the potential for transfiguration in the domestic, as well as in the natural world. Highly recommended. Do not miss. Frith Street Gallery, 17-18 Golden Square, London W1F 9JJ.